The Equinox® is the balance between day and night. 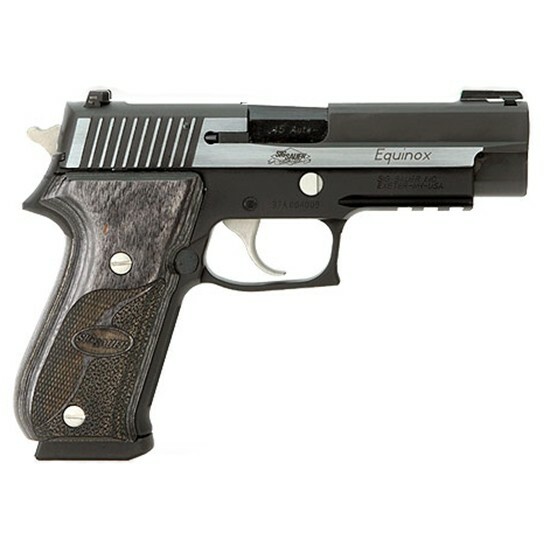 So it should come as no surprise that the SIG SAUER® P220® Equinox has evolved from the SIG SAUER® Custom Shop. 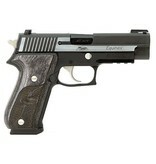 The P220 Equinox is a limited .45ACP designed by SIG SAUER Custom Shop master gunsmiths. It features a two-tone accented Nitron® stainless steel slide with a lightweight black hard-anodized alloy frame. The contrast in color is achieved by the brush polished flats of the slide and nickel accents. The combination of the TRUGLO® Tritium Fiber Optic front sight and the rear SIGLITE® night sight, provides excellent target acquisition, whether shooting day or night. To further enhance the low-light use, the Equinox comes equipped with an accessory rail. To complete the package, the Equinox comes with gray laminated wood grips with a perfect blend of checkering and stippling to enhance not only the form but the function.